Manchester Metropolitan’s student athletes did not disappoint when going for gold this weekend as they took on the country’s best emerging sporting talent at the BUCS Nationals tournament. Over the course of the weekend (February 15 to 17), Manchester Met athletes secured a haul of medals with particular success in swimming and karate, coming away with four gold, three silver and five bronze medals and a total of 102 BUCS points – up from 32 points last year. More than 60 student athletes represented the University across seven sports. The British Universities & Colleges Sport (BUCS) tournament featured 6,000 athletes from across the country, battling it out in the UK’s largest annual multi-sport event. Following Manchester Metropolitan’s most successful results in the BUCS Short Course Championships in December, the team continued its success in the long course competition this weekend. After recently returning from a shoulder operation, para-swimmer and MMU Sport Scholar Tully Kearney started the medal haul on Saturday with a gold in the 200m freestyle S5. She also went on to win a further gold in the 100m freestyle S5 on Sunday. And if winning was not enough, Tully also broke two new British records in both of her races. First Tully managed to break the 50m and 100m records when racing in the 200m freestyle. Then on the Sunday she broke the 50m record again en route to the 100m title. After finishing in the fastest time in her heat, sport scholar Chloe Golding kept up the pace and also won gold in the 100m backstroke. Other swimming scholars who also came away with top results were: Katie Matts with two bronze and one gold medal; Lewis White with one bronze and one silver medal; Emma Day with a silver, and finally the women's relay team came in third place with a bronze medal. The combined swimming team also climbed the BUCS swimming league table from ninth place to fifth. Saturday saw Kelly Horsfall fight her way to the podium, picking up a silver medal in the women’s novice kata category. Tyler McKenna also came away with a bronze medal in the men’s senior kumite under 75kg category, topping Manchester Metropolitan’s total medal count at 12. Jérôme Read, Head of Performance Sport, said: “We are so proud of all of our athletes who competed this weekend. We are always up against some tough competitors but have seen a huge improvement on last year’s performance, particularly in the swimming pool and on the karate mats, and have come away with some impressive medals. 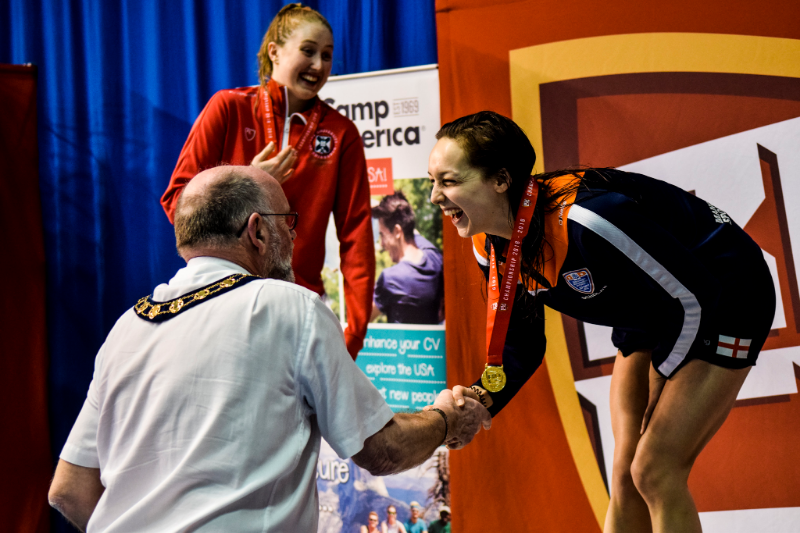 “The performances at the BUCS Nationals this weekend consolidate Manchester Met’s ongoing progress within the British university landscape of sporting excellence, and is a result of the strategic long-term plan that has helped develop those clubs involved.